Robert Lustig is at the forefront of war against sugar — showing us that it's toxic, it's addictive, and it's everywhere because the food companies want it to be. His 90-minute YouTube video "Sugar: The Bitter Truth" has been viewed more than 7 million times. Now, in this landmark book, he documents the science and the politics that have led to personal misery and public crisis — the pandemic of obesity and chronic disease--over the last thirty years. In the late 1970s, when the U.S. government declared that we needed to get the fat out of our diets, the food industry responded by pumping in more sugar to make food more palatable (and more salable), and by removing the fiber to make food last longer on the shelf. The result has been a perfect storm for our health, disastrously altering our biochemistry to make us think we're starving, drive our eating habits out of our control, and turn us into couch potatoes. If we cannot control how we eat, it's because of the catastrophic excess of sugar in our diet--the resulting hormonal imbalances have rewired our brains! To help us lose weight and recover our health, Lustig presents strategies we can each use to readjust the key hormones that regulate hunger, reward, and stress, as well as societal strategies to improve the health of the next generation. 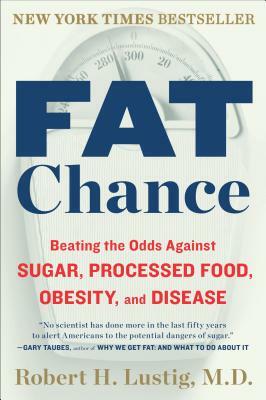 With scientific rigor and even a little humor, Fat Chance categorically proves that "a calorie is not a calorie," and takes that knowledge to its logical conclusion--an overhaul of the global food system.